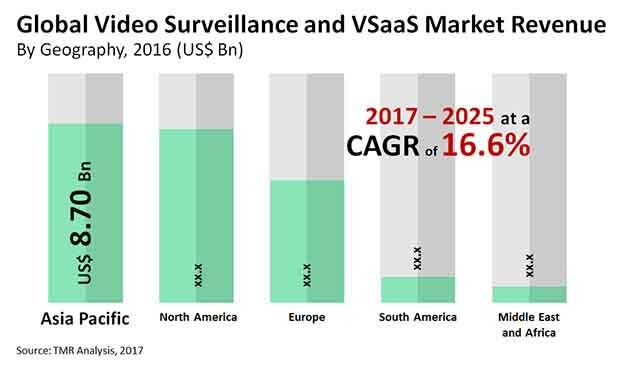 The global video surveillance and video surveillance as a service (VSaaS) market is envisaged in a report by Transparency Market Research (TMR) to find an intense level of competition continued until the end of the forecast period 2017-2025. There could be attractive opportunities for new players despite the presence of established companies in the market. However, this could mean that the competition could become fiercer in the coming years. In this regard, players are expected to enter into strategic collaborations and partnerships to survive the rising competition. Such tactics could help them to gain advantages pertaining to distribution channels and access to cutting-edge technologies. Axis Communications AB, Dahua Technology, and Hangzhou Hikvision Digital Technology Co. Ltd. are key players of the global video surveillance and VSaaS market. TMR projects the global video surveillance and VSaaS market to post a 16.60% CAGR to be valued at a US$101.70 bn, rising from a valuation of US$25.11 bn obtained in 2016. The market could witness IP-based video surveillance and VSaaS’ achievement of an exponential CAGR of 20.80%. On the regional front, Asia Pacific is anticipated to lead from the front considering its US$8.70 bn revenue earned in 2016. Rising security concerns in most regions of the world are predicted to increase the demand in the global video surveillance and VSaaS market. Illegal infiltrations and terrorist activities could be tracked with the help of video surveillance technologies. In order to push their counter-terrorism activities, a number of countries are investing in advanced surveillance networks and forward-thinking video surveillance equipment. There could be rewarding prospects birthed in the market on the back of increased application of video surveillance for critical infrastructures. Demand for video surveillance and VSaaS is envisioned to see a rise with the need to maintain the security and resilience of networks, systems, and other assets, keeping in view the rapid spread of criminal and terrorist activities across the globe. High bandwidth requirements in the corporate sector with rising use of IT applications are foreseen to slow down the demand in the global video surveillance and VSaaS market. Bandwidth challenges could grow strong with the shift from physical security to IP-based video surveillance and VSaaS solutions. As a result, it could be very tough for advanced security systems to accommodate more applications and users and operate in growing networks. Nonetheless, artificial intelligence and other technological developments are foretold to create ample of opportunities in the global video surveillance and VSaaS market. Optimization of the use of surveillance and improvement in physical security with the integration of video analytics could cause the demand in the market to surge in the near future.